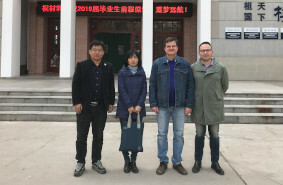 During the visit, joint works with the group of Prof. Qingfeng Zeng on the development of a topological model of phase transitions and prediction of new inorganic compounds are continued. In addition to this, development of new methods for modeling porous materials for 3D printing is initiated and the first samples of such materials have been obtained. In collaboration with Prof. Junjie Wang, the search for new electrides, which are an unusual class of materials containing isolated electrons, has been started. With Prof. Yi Wang and Prof. Xiaoli Fan, joint researches aimed at finding new high-entropy alloys are planned. An agreement was reached on organizing a joint conference and a scientific school on methods of theoretical materials science. This will be held in Xian in October 2019 and will be attended by research groups from NWPU and SCTMS.